Organizations rely extensively upon a myriad of images and pictorial representations such as budgets, schedules, reports, graphs, and organizational charts to name but a few. Visual images play an integral role in the process of organizing. 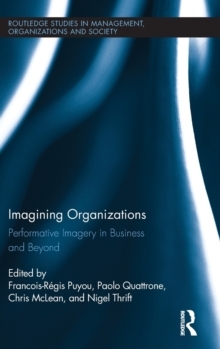 This volume argues that images in organizations are `performative', meaning that they can be seen as performances, rather than mere representations, that play a significant role in all kind of organizational activities. Imagining Organizations opens up new ways of imagining business through an interdisciplinary approach that captures the role of visualizations and their performances. Contributions to this volume challenge this orthodox view to explore how images in business, organizing and organizations are viewed in a static and rigid form. Imagining Business addresses the question of how we visualize organizations and their activities as an important aspect of managerial work, focusing on practices and performances, organizing and ordering, and media and technologies. Moreover, it aims to provide a focal point for the growing collection of studies that explore how various business artifacts draw on the power of the visual to enable various forms of organizing and organizations in diverse contexts.